Mayor says property taxes will be reduced – Welcome to Wyandotte Daily! 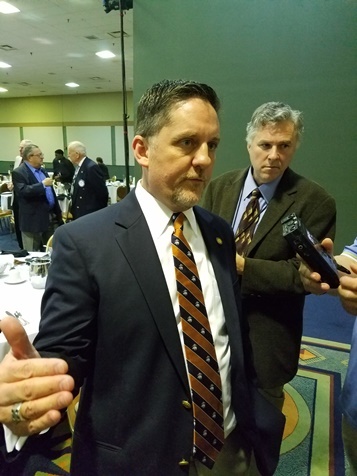 Mayor Mark Holland at his State of the Unified Government speech today pledged to reduce the city property tax to its lowest rate in 50 years. 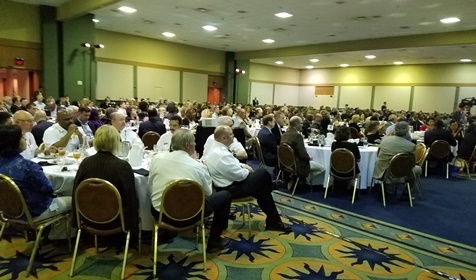 The State of the UG speech was held at a meeting of the Downtown Rotary Club at the Reardon Convention Center. Mayor Holland discussed a 2 percent property tax decrease this year, following on the 2 percent decrease approved last year. The mayor, who is running for re-election in the fall, also talked about a public safety review to promote safety, stability and fairness, and the recent contract with the firefighters’ union. In addition he discussed the UG’s recent blight reduction program, that he said would improve 10,000 unfit or vacant properties by 2021. The mayor also said he would continue efforts to make the UG more accessible and transparent with televised meetings, online open data portals and an easy-to-use online records request system. The mayor said the agreement between the firefighters, the Fire Department and the UG will keep the community safe and put the Fire Department on a path that clears the way for construction of a new fire station in western Kansas City, Kan. 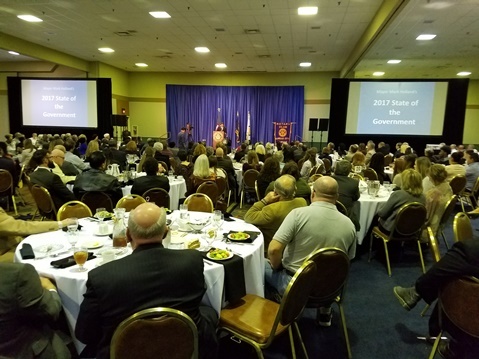 In his speech, the mayor also mentioned several new economic developments in Wyandotte County, including an Amazon distribution center under construction, the American Royal project, the Dairy Farmers of America project and the U.S. Soccer Training Center, as well as the downtown healthy campus project. He cited economic savings that had been made through not farming out jail inmates to other counties, and also discussed mental health initiatives that save the county money. The mayor also advocated for programs such as Medicaid extension and the Affordable Care Act, which he said helped thousands of Wyandotte County residents. Replays of the video of the mayor’s speech might be available in the future on YouTube. Photos copyright 2017 by William Crum.